In a medium saucepan, set over medium heat, add the sugar, water, vanilla and pecans. Stir with a wooden spoon or spatula, occasionally, as it heats. It will come to a simmer, continue to cook for about 6 to 8 minutes. The pecans will be entirely covered by the transparent liquid and there will be a strong simmer. Suddenly, the mixture will appear as if completely covered in sand: grainy and you will think you have messed it up! You have not. Continue to cook, and that clumped up sugar will begin to melt and caramelize around the already hardened and covered pecans. Stir continuously and don’t let the pecans burn. Adjust the heat if need be. You should continue until you see no more white sugar, and it is all melted and caramel covered, about 10 minutes more. Once they have completely cooled and dried, you can store them at room temperature in a tight container. Pati, have you considered or would you even consider adding just a touch of cinnamon to this recipe? My daughter and I saw this episode and wondered if you could send the video link for us to watch it again (we are visual learner’s), also we jumped up and said “oohhhh, we can “Ketofy” this recipe with changing the flour with almond flour and the sugar with Swerve. Pati, as Hispanics, we LOVE watching your episodes and would love to see more of your recipes with a “low carb, more fat (good fats) and sugar substitute” emphasis, only because as American’s we are facing a type II diabetes epidemic. Your recipes remind me of my Mexican’s mothers cooking back in the day. Thank you! I am happy to see your show here in AZ. It is because we subscribe to another cable t. I will cook your Flourless almond cake tomorow. Your show is terrific. Your enthusiasm is super. I love your show. My family and I enjoy your program and making your recipes. We are looking forward to obtaining your new book. thank you. Hola Pati! I just finished watching this episode and all the recipes look so delicious and super easy. I’m especially anxious to try the caramelized pecans. 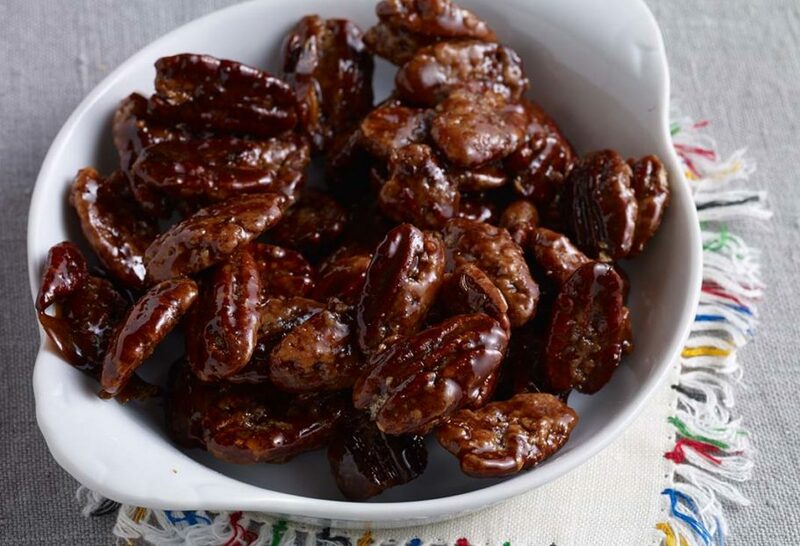 I always make spiced pecans as Christmas presents for family but this may be a new favorite! Thanks!